How Was the Market in Milwood for 2012? The real estate market in Milwood had some tremendous growth in 2012. After a crazy January month for me, I finally had time to sit down and look at how the market performed and wanted to share some number with you. All of this information is visibly represented in the graph below. First of all, the real estate market in Milwood was much more active – 229 homes sold in 2012 vs 194 in 2011, a 18% increase. While the number of homes sold grew remarkably, the average sales price increased only 1.3% to $181,764 vs $179,476 in 2011. The average price per square foot of homes sold in 2011 was $99.68 but grew to $105.59 in 2012, an increase of almost 6%. By far, the most significant change in the Milwood real estate market in 2012 was the average time a home was on the market before it sold. The average days on market shrunk from 58 days to 38 days, a decrease of 35%. 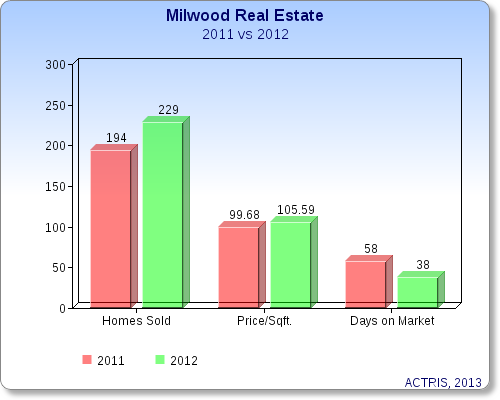 What do these numbers mean to you if you are looking to buy or sell a home in Milwood in 2013? If you are looking to buy a home in Milwood, you will likely be paying slightly more than you would have in 2012. You will also need to be decisive and move quickly once you find a house you like – the lower number of homes on the market and quicker selling times mean your competition (other buyers) might get a home first if you’re not careful. Drop me a note if I can help you find a great home in Milwood this year. If you are considering selling your home in the Milwood area of Austin, you should definitely be able to walk away with more money this year. If you price your home too low, you might get multiple offers as soon as you go on the market. Marketing can have a lot do with getting your home sold quickly and for the highest net to you. Drop me a note to hear about how my progressive marketing plan can go to work for you!